Ok, are you ready to see it? Like I said, it’a a 2013 model. A model of the 2013 F138 Formula One Ferrari. A LEGO model! And it has a little motor in the back; the kind where you pull it backwards and then let it go. Not a single mile on it as it was still in the package that I opened up today. Sorry for the ruse. It was all in good fun. 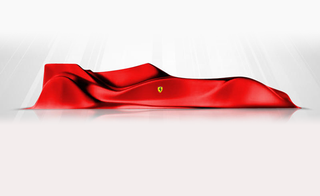 Also, for a laugh, the header picture is Ferrari’s teaser pic for the actual F138. So sorry. I hope you all had a good laugh. For your trouble, here are some pics of it. See, it’s a real Ferrari! The rest of the set, which I now need to track down. Again, sorry for the ruse. I really hope you had a good laugh. If you need me, I’ll be playing with my LEGOs.